This article first published as Blu-ray Review: Once Upon a Time: The Complete First Season on BlogCritics.org. The concept of ABC’s Once Upon a Time, the complete first season of which is now available on Blu-ray, is deceptively simple. Emma Swan (Jennifer Morrison) is shocked when the son she had given up for adoption 10 years before shows up at her doorstep. What’s even more shocking is the boy tells her she must save Storybrooke, the small town he lives in, from an evil curse. It seems Storybrooke is the home of every character from childhood stories of old. Snow White, Gepetto, Jiminy Cricket, Cinderella, Red Riding Hood, and Prince Charming all live in Storybrooke, only they don’t know who they really are. They’re regular people who have been cursed to live an ordinary life by the Evil Queen. That’s the basic premise for the series. The idea almost seems too far-fetched for network TV. A prime time drama about Snow White aimed at adults seems like kind of a crazy idea. But to my surprise, it totally works. Once Upon a Time is full of intrigue, imagination, and great characters. Every person who lives in the Maine town of Storybrooke came from a realm where kings and queens ruled, faeries flitted about, and magic was the most powerful tool in all the land. They were unknowingly transported there by the Evil Queen. It seems she wanted to abolish all happy endings after learning Snow White was resurrected from the poison apple curse by true love’s kiss. Knowing the curse was upon them, Snow White and Price Charming were able to shield their newborn daughter from it. Their daughter, it turns out, was destined to return and save them when she reached 28 years of age. It’s Emma Swan’s 28th birthday when her son comes to find her. He’s convinced she is the one destined to save them, even if she isn’t. Emma travels to the town just to bring her son Henry (Jared Gilmore) back to his adoptive mother. However, upon meeting Henry’s mother Regina (Lana Parrilla) Emma decides to stay. She then starts meeting the people of the town, whom Henry insists are characters from a book given to him by his teacher Mary-Margaret (Ginnifer Goodwin). Henry believes Mary-Margaret is really Snow White, and is therefore Emma’s mom. Regina, who is the mayor of the town, he believes is really the Evil Queen. He says the town has been frozen in time for 28 years waiting for the curse to be broken. And it does seem that upon Emma’s arrival that things start to change. The story is told by bouncing back and forth between the storybook realm and the modern times. It basically takes what we know of the characters from their stories and expands them into having full lives, with families, work, and (since this is the magical realm) supernatural dealings with faeries, sorcerers, and genies. In the real world they live their lives completely unaware of their magical past. They are also unaware that time does not pass, they stay the same age year after year, and in the case of poor Cinderella, pregnant for 28 years. Though the characters are unaware of the past, there are many clever little links scattered throughout the town. Many links to the past can be found at Mr. Gold’s (Robert Carlyle) pawn shop. Mr. Gold is a rather dubious character who plays all sides. In his “other” life, Mr. Gold was Rumplestiltskin. The legend of the character has been greatly expanded on to make him a ruthless wheeler and dealer, as well as a powerful practitioner of black magic. He is also much more than that, but I wouldn’t want to give anything away. Mr. Gold is similarly interested in making deals where he gains and everyone else loses. Carlyle really steals the show in every scene he is in. 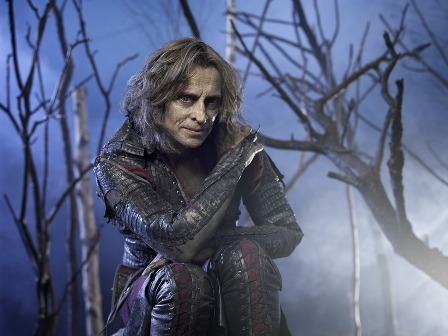 I personally can’t get enough of the Rumplestiltskin/Mr. Gold storylines. Carlyle brilliantly gives the characters unexpected nuances nearly every time he makes an appearance. Mr. Gold continually propels the show in different directions with his mysterious ways. He is by far the most interesting character on the show. Once Upon a Time revolves mostly around Emma, Mary-Margaret, Regina, Henry, and David Nolan (Josh Dallas), whose counterpart is Prince Charming. It’s fun to watch how the past intertwines with the present and how all the stories fit in with each other. Previously unrelated stories are jammed together in the magical realm. The Mad Hatter takes the Evil Queen to Wonderland, while the Evil Queen sends Hansel and Gretel to the candy house, and Rumplestiltskin knows everyone. In the real world it can be kind of a puzzle to figure out who a character corresponds to in the storybook world. Some of them are very familiar and some are a little more obscure. The show offers many unexpected surprises, even to those familiar with the characters. Red Riding Hood’s back-story is a bit shocking (as is the skimpy outfit she wears at the restaurant she works at). There is certainly a lot more to Jiminy Cricket than meets the eye. The episode explaining his origins is one of my favorites. It took me three or four episodes to really appreciate the show, but once I got into it I was hooked. The actors really get into their roles, and not just Carlyle. Jennifer Morrison anchors the show as the skeptical Emma, though she doesn’t get as showy of a role since she has no storybook world counterpart. Ginnifer Goodwin has many nice moments as the good-natured school teacher that contrast with the wide variety of emotions she displays as Snow White. Lana Parrilla makes a hissable villain, always evoking a sense of evil whether playing the Queen or Regina. The strong ensemble cast is one of Once Upon a Time’s greatest assets. 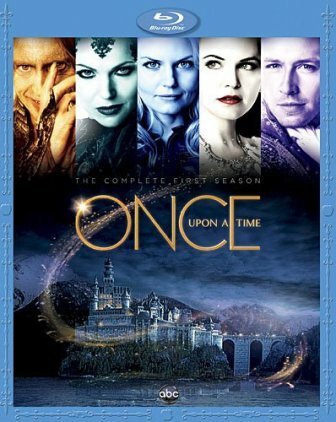 The Blu-ray edition of Once Upon a Time: The Complete First Season is presented in a 1080p MPEG-4 AVC-encoded transfer with 1.78:1 aspect ratio. Overall I found this to be a pleasant looking Blu-ray that makes good use of its widely varied visuals. The lush greens of the forest that surround the town stand out. The bright colors of the fairy-tale world are striking, particularly the bright pastel dresses worn by the faeries. The special effects hold up well even with the enhanced clarity the format offers. The sound is presented in 5.1 DTS-HD Master Audio. The sound is well mixed, with a nice balance between dialogue, music, and effects. The galloping hooves of horses, the gusting winds following conjured spells, and the ambiance of the forest fill the surrounds. Dialogue is always clear and easy to understand. Overall it’s a good audio and visual presentation. There are plenty of special features on this set. These include audio commentaries, deleted scenes, bloopers, and several featurettes. A Blu-ray exclusive is the “Once Upon a Time: Origins” feature that explores the origins of the stories of Snow White, Beauty and the Beast, Rumplestiltskin, The Little Mermaid, and Little Red Riding Hood. This was kind of a cool feature that provided a brief history lesson about the stories that extended beyond the familiar Disney film versions. The other featurettes concern the creation the show, with the cast and crew talking about their characters, the show, and their own memories of fairy tales. Once Upon a Time is a creative and well-made show. The series gets off to somewhat of a slow start, but it doesn’t take long to get into high gear. The intertwining of all the stories is fun to watch. It’s worth checking out for newcomers, especially since season two doesn’t premiere until September 30. The variety of special features and overall strong presentation make it worth revisiting for those who watched it as it originally aired.